These Free printable dinosaur coloring Pages are so much fun! Our artist, David Cobb, carefully researches each species to make sure he is drawing a picture whose likeness is accurate according to paleontologists’ finds. Then he adds a bit of quirky character just for fun. We think the pictures bring the dinos alive. The downloads are free and printable pdf's, so help yourself. They come from our books on the geologic eras and periods. The books are inexpensive research tools for young students. We wrote them so the children in our own classrooms would have high-level information written in easy-to-understand language and using easy words. Except for the words that are particularly related to the topics, we used the first 1000 sight words. We were careful not to break words over the lines and challenging words are split into pronunciations. Teachers all around the country are telling us that their students have found the books to be just what they needed to support their students’ learning. And, they are so affordable, you may want to buy a set for your young artist to color for themselves. You can preview the text of these books on our Montessori Materials page. The books may be purchased at our store at www.fossilicious.com. 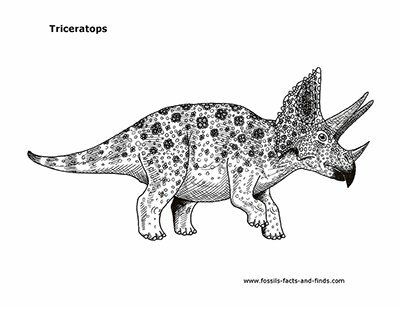 The dinosaur coloring pages are free and printer friendly in PDF format. You will need Adobe Reader in order to view or print these files. If Adobe Reader is not already installed on your computer you may download it free here. (A new window will open so you can download without leaving this page). If you want to open the file in your browser window, you can just click on the link. However, if you want to download the file to view later, then right click on the link and choose "Save Target As" or "Save File As." Then select where you want to save the file on your hard drive.